Does your home feel uncomfortable even when your A/C is running full blast? Heads up! Something might be wrong with the airflow. 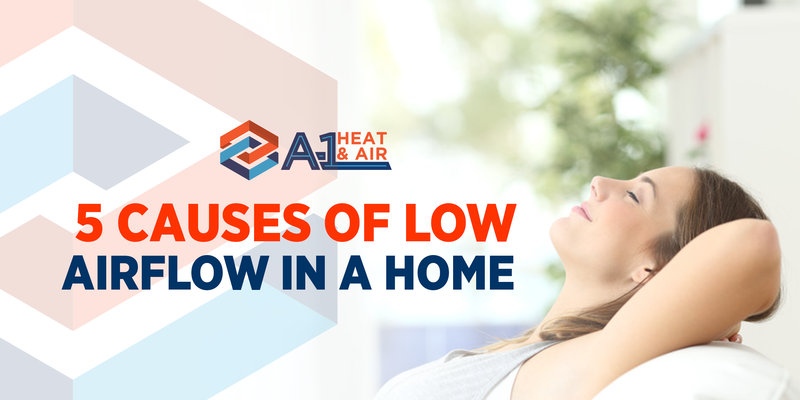 Here are common causes of low airflow at home that you should watch out for. For HVAC systems that use air ducts for carrying air back and forth, keeping them clean and maintained is necessary. Dust and dirt accumulated in the ductwork can block the air to pass through. If the system is clogged or has leaked, the air may not reach its destination. This results in uneven heating or cooling at home. You may run into significant problems and costly repairs if you do not clean or change your filters regularly. Duct problems? Contact us at A-1 Heat and Air for immediate solutions. This summer, it is essential to get the right size of air conditioning unit. It should be neither too big nor too small. Otherwise, your HVAC system will not work efficiently in cooling the entire house. Wrong sizes for ducts and vents also cause low airflow. The size should fit your load requirements to allow the air to propel or flow properly. Need advice for the right HVAC sizing? We can help! Do not neglect your outdoor unit! The fact that it stays outside, the more dirt it can accumulate. From time to time, it is exposed to various kinds of elements such as leaves, harsh weather, wind, snow, and dust. Dirt buildup can lead to poor airflow and worse, it may stop cooling your space. So, clean your outdoor unit religiously for your sake. Need to schedule cleaning maintenance for your outdoor unit? Call us for the service! If you think the issue lies in the thermostat, then you are right! Faulty or outdated thermostats are sometimes the cause of airflow problems in your home. Particularly for large residential spaces, thermostat incompatibility is likely to happen. Old or too small thermostats may not regulate the air effectively if it is not compatible with your home. Want to purchase or install a new thermostat? Our experts can lend a hand. The condenser coil is responsible for removing the heat from your space. If it is clogged due to dirt or dust build up, your unit will work harder to cool your home. Your space can get hotter this spring or summer if the coils have airflow issues. Dirty or clogged coils? You surely need a professional cleaning service for that! We at A-1 Heat and Air Conditioning want to keep your home at its utmost comfort. If you need any help regarding airflow issues, give us a call and we will be there in no time.